If you're considering splashing out on a trampoline for you and your family, there are many different sizes, brands and models on the market to choose from. Whilst all this choice is great, it can be hard to know which type of trampoline will make the best addition to your back yard at home. Luckily, trampoline reviews are what we do best. Recently, we've been looking at the Skytric brand, to find out whether they represent good value in terms of quality and safety. So, are these trampolines the best choice for you and your family? 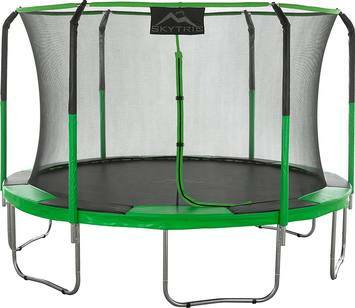 Read on for our Skytric trampoline review. How is Skytric Trampoline Assembly? How Does Skytric Compare to Other Brands? 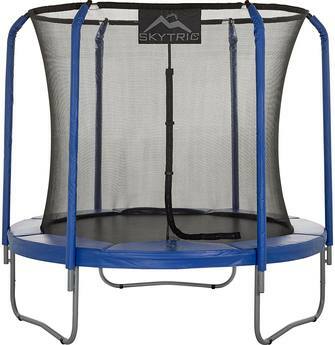 Where Do I Find a Skytric Trampoline For Sale? One thing we look for in a trampoline is a wide range of sizes and models. This is because every consumer is slightly different, and have a varying amount of space in their yards. Luckily, Skytric have a lot of choice when it comes to trampoline size, so unless you are extremely tight for space then you will most likely find something to fit in your yard. Read on to find out more about the individual models. This is the largest offering from Skytric trampolines, and is ideal if you have a very large backyard that can accommodate it. However, before you rush into purchasing a 15 foot trampoline, be realistic about the space you have available. Many customers purchase the biggest trampoline possible, only to be shocked by how large a 15 foot trampoline actually is once it's assembled. Be sure to measure your yard carefully, allowing for a safety margin, and think about whether you want to give up the large amount of space necessary for your trampoline. Galvanised steel frame: When you're purchasing a trampoline, it's always a good idea to look for galvanised steel. That's because galvanised steel is strong, sturdy and will resist rusting in adverse weather conditions. W-shaped legs: This model has 6 W-shaped legs. This leg shape provides extra stability for the trampoline, making it less likely to shift position during use. This is very important for safety during use. ​Safety net enclosure: Especially if children will be using your trampoline, a net enclosure is key. This prevents anyone from accidentally bouncing off the trampoline, which can be incredibly dangerous. We like the fastening on this particular enclosure, as it has a double-sided zip closing. This means the enclosure can be zipped up whether you're inside or outside the trampoline. We recommend zip entrances over Velcro, as they close more securely and prevent anyone from falling out of the entrance and hurting themselves. Top Flex Pole Enclosure System: Skytric cite these poles as one of their unique selling points, and say they make these poles make the enclosure stronger and more durable. ​Foam padded frame: The section of frame around the circumference of the jumping mat has a thick foam padding. This provides added safety, as if anyone overbalances and lands on the frame, their fall will be broken by the soft surface. Easy to assemble enclosure poles: Skytric say their enclosure poles are particularly easy to put together and take apart because of the special way they have been manufactured. Please note that this smaller model differs slightly, as it has 3 W-shaped legs as opposed to the 6 on the other models. Most users reviews of these trampolines are positive. Firstly, buyers comment that they are high-quality, sturdy and can withstand vigorous use by their kids. It also seems that the springs on this model are high-quality and give a good and smooth bounce action. It also appears that Skytric's claims about their enclosure poles are true, as consumers have said that the poles are very durable and support the net enclosure well without it sagging. 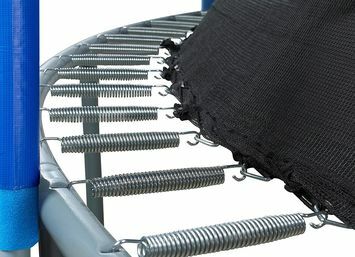 However, some users have commented that the assembly of the trampoline can be frustrating as a few buyers received trampolines where the screw holes didn't line up properly. Feedback from purchasers about the assembly process for Skytric trampolines is a complete mixed bag. Some people say that, whilst not especially quick, assembly was not particularly onerous either. On the other hand, many customers say that assembling their trampolines took a long time and was complicated. As we mentioned above, a few customers received models with poorly aligned screw holes, which made the assembly process more complicated. Certainly, it sounds like assembly of any model of Skytric trampoline is at least a two-person job. With so many different trampolines on the market nowadays, it's only natural that you will want to know how a Skytric trampoline compares to them before you commit to a purchase. To help you figure out how Skytric trampolines measure up to the competition, we've compared them to two other popular brands currently on the market. Interestingly, the Sktric brand is actually the sister company of the popular brand Upper Bounce. As such, they share many of the same features, including the easy-assemble poles, padded frames and galvanised steel construction. The key difference between the Skytric models and the Upper Bounce trampolines iare the sizes. Upper Bounce have a wider range of options, with 7.5', 9', 10', 12', 14', 15' and 16' options available. Skytric and Skywalker trampolines again share many of the same features. However, the Top Flex Pole Enclosure System that is a feature of the Skytric trampolines is not present in the Skywalker brand. Both have a sturdy galvanised steel construction and a padded foam frame to protect from injuries. However, we prefer the double zip fastening on the Skytric model, as it is more secure. 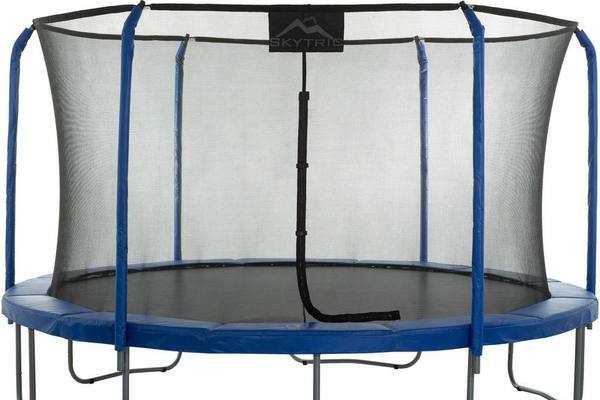 On the other hand, Skywalker offer a rectangular trampoline which Skytric don't. A rectangular trampoline may be worth your consideration, as it provides a larger bouncing area for the amount of space it takes up in your yard. The weight limits for the Skytric trampolines is 350 lbs. The only exception if the 8ft model, which can safely accommodate 330lbs. Whilst there are trampolines on the market that can take upwards of 500lbs, this is still a bit higher than many models available for purchase. 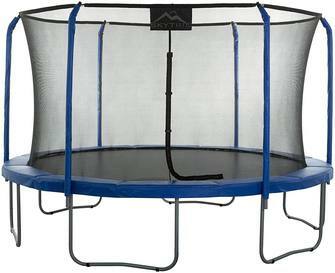 A Skytric trampoline will easily accommodate the weight of a fully-grown adult male. We were able to find some replacement parts for Skytric trampolines on Amazon, which are sold by Skytric themselves. These included replacement jumping mats and enclosure poles. However, we were not able to find all of the Skytric components on Amazon. Before you consider replacing or repairing your trampoline using generic replacement parts, please measure carefully to ensure that they will be compatible with your trampoline model. 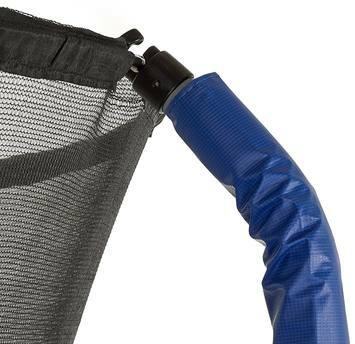 One of the main things we like about the Skytric trampolines is the durable enclosure nets. As the net enclosure is a key safety feature of any trampoline, it's great to know that customers agree with Skytric's assertion that the enclosure poles are strong and durable. This means that you can count on your enclosure providing security for your family for many years. It's also a big plus that you can purchase replacement poles with the same construction. We also like the fact that you can buy replacement parts that are specifically manufactured to be compatible with Skytric trampolines. This takes the guesswork out of purchasing replacement parts, as you know they will be a good fit and will be straightforward to install. We also like that the trampolines come with a spring fitting tool. These are a great addition as they make the tricky job of fitting and replacing springs on your trampoline much easier and safer. We are also impressed with the double zip enclosure entrances. We think it's fantastic that the enclosure entrance can be fastened from both inside and outside the trampoline. We prefer these types of fastenings as a rule, as they provide much more security than other fastenings. 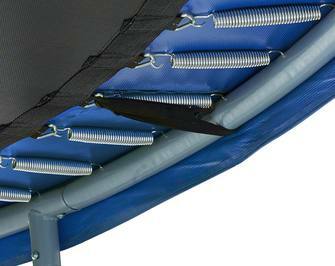 They prevent people from accidentally falling from the trampoline entrance, which can lead to nasty injuries. An important part of purchasing and enjoying your trampoline is a simple and straightforward assembly. From what we've read, it sounds like many customers find the assembly process both complicated and arduous, and this is obviously a drawback. Hopefully, Skytric will address this issue, as nobody wants to spend hours and hours struggling to put up their brand new trampoline. We were also concerned to learn that some customers felt they had received goods that had mis-aligned screw holes. This makes assembly a real chore, and you should rightfully expect that your trampoline will arrive with everything produced correctly. Furthermore, a few customers commented that it was not easy or straightforward to get hold of a replacement for the faulty parts. Thankfully, it sounds like this is rare. However, as we value good customer service, hopefully these issues will be ironed out. 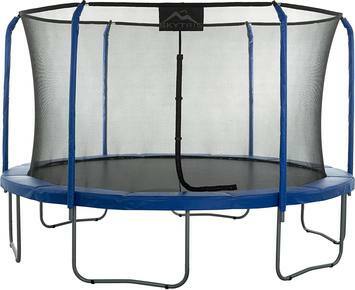 An addition we would like to see to the Skytric range is a square or rectangular trampoline. This would offer more choice to consumers, as not everyone wants a circular trampoline. Also, a square or rectangular trampoline provides a greater surface area on the jumping mat. This means you get more room to bounce from the amount of space it takes up in your yard. Overall, if you're looking for a durable and safe trampoline for you and your family, we think Skytric are a good option for most families. The safety features on these trampolines are very good, so you have peace of mind that your kids are unlikely to injure themselves while using them. However, as with any trampoline, it is important to inspect it regularly for damage to make sure that it is safe and secure. Even highly durable trampolines like the Skytric models can and do break or wear, and you should check all the key components often to ensure they are in an acceptable and useable condition.